If you want a unique looking velvet fashion blazer that you won't see everyone else wearing, try After Midnight. After Midnight makes fancy mens fashion clothing like velvet blazers and jackets that you just don't see on everyone out there. 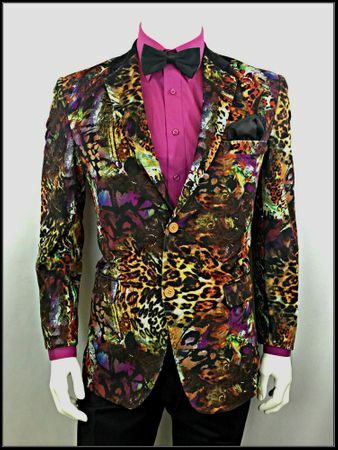 This leopard and animal print computer design print velvet blazer feature side vents and contrasting black velvet collar as well. You can even wear this as a fancy tuxedo jacket if you so choose. The fabric is all velvet with an animal design all over. Modern Fit.